UFCW Canada and the Agriculture Workers Alliance – two of the country’s leading migrant worker advocacy organizations – are applauding and defending the findings of two new reports that make a direct link between worker illness and the shortcomings of Canada’s migrant worker system. Despite being led by two separate teams of distinguished doctors and researchers, the findings of the reports are being attacked by the Ontario Federation of Agriculture (OFA). Recently published in the prestigious Canadian Medical Association Journal (CMAJ), the two new reports, entitled “Temporary Migration, Chronic Effects: the Health of International Migrant Workers in Canada” and “Doctors within borders: meeting the health care needs of migrant farm workers in Canada”, confirm what migrant worker advocates have long suspected. “To suggest these thoroughly researched reports, which include the standardized survey responses of over 600 workers, are misleading in some way is total nonsense and in the self-interest of the Ontario Federation of Agriculture,” says UFCW Canada National President Wayne Hanley, making direct reference to statements made by the OFA in “Better Farming” that “challenge” the reports’ findings for their “wild and unsubstantiated claims”. “Every year, we hear from tens of thousands of farm workers who are suffering from the serious physical and mental health problems identified in these reports, and most of those workers come to Canada through the Seasonal Agricultural Workers Program,” adds the national leader of Canada’s largest private-sector union. 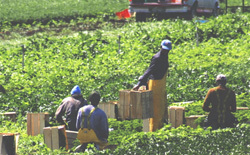 UFCW Canada in association with the AWA operates ten agriculture worker support centers from British Columbia to Quebec, and services more migrant workers than any other organization in Canada. Since 2001, UFCW Canada has published an annual report that scrutinizes the status of migrant farm workers in Canada, and offers policy makers a series of recommendations that are fully supported by a growing field of research that includes the two new reports. “Those of us who are fighting for the rights of Canada’s migrant agriculture workers hope these reports and their findings will attract the attention they deserve, because they reconfirm what labour and social justice activists have long known: that a system built on exploitation creates a toxic stew of health related issues that only hurts the workers who grow our food, their families, and Canada’s international reputation,” says Hanley.